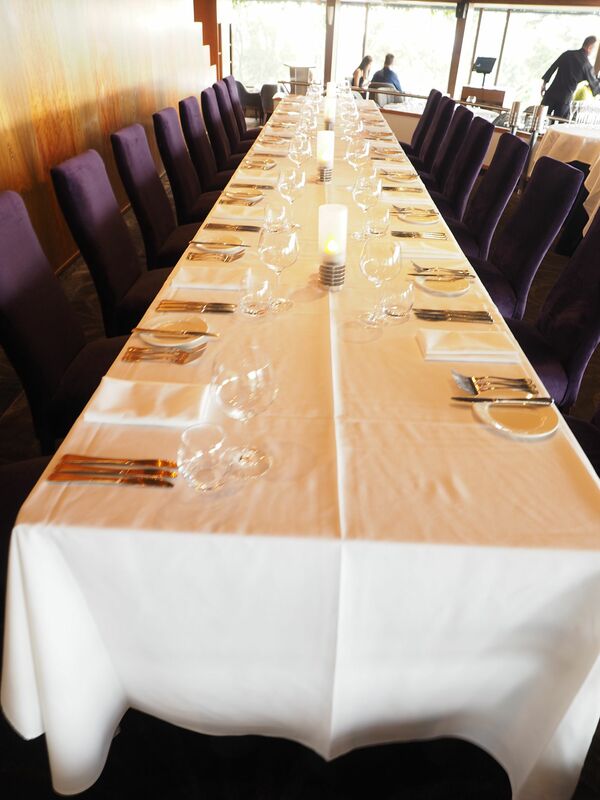 Windy Point Restaurant has launched their summer degustation menu in Early Feb 2015. I am sure this restaurant does not need a full introduction. Diners, whether visitors or locals, would not want to miss one of Adelaide’s most iconic restaurants. It has been an icon since 15 years ago and from memory, people were willing to wait for weeks then to get a seat/reservation. I’ve dined there a couple of times and it never disappointed me. When an invitation fled into my mailbox, an acceptance was to show how much I appreciated this place. 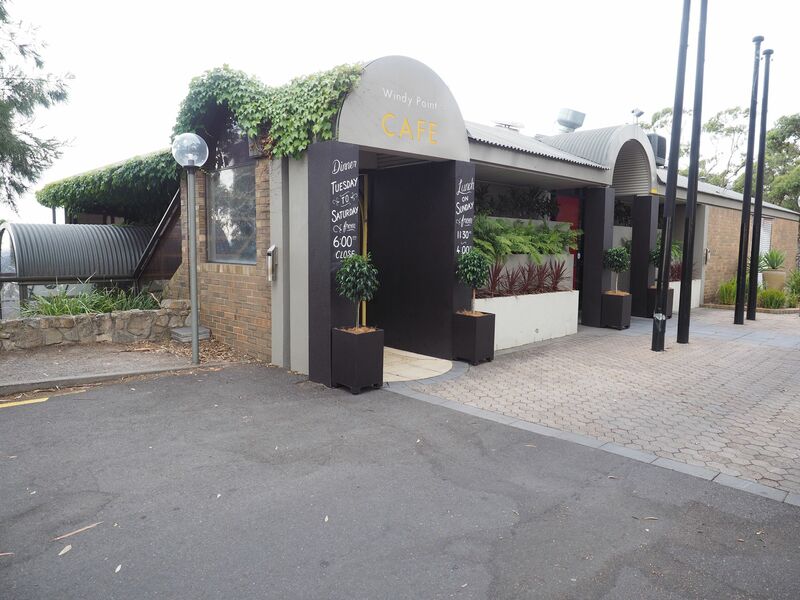 Windy Point Restaurant is tucked away in Adelaide’s most visited scenic view, Windy Point, which can overlook the Adelaide plain and the entire city, especially with lightings at night. Sitting in the restaurant with the roof top fully opened, diners can expect to observe from beautiful sunset to completely darkness with artificial lights and stars in the sky in just a flash. 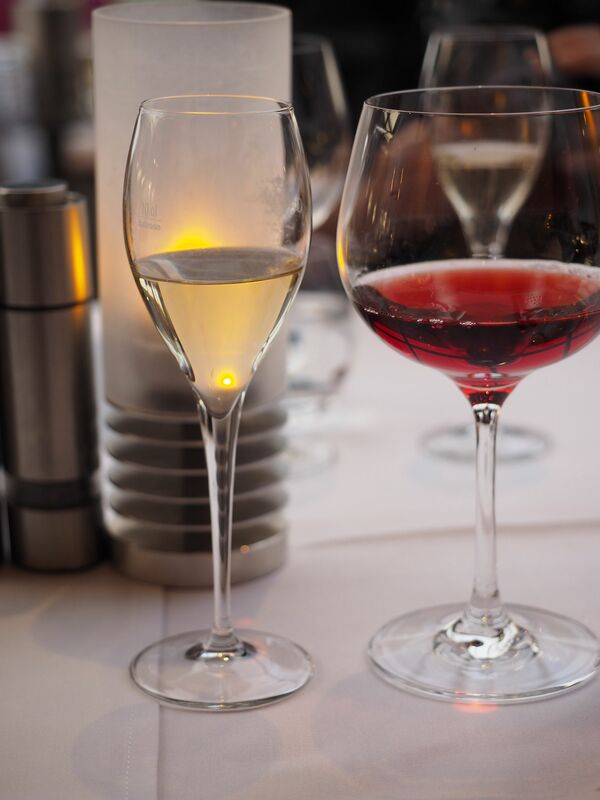 It is truly a romantic and enjoyable dining experience that cannot be substituted elsewhere in Adelaide. People used to dress up to dine at the restaurant but nowadays I noticed many casually dressed diners. The classic decor combining with the people and the fantastic view inside the restaurant itself make one of the most extraordinary experience already. 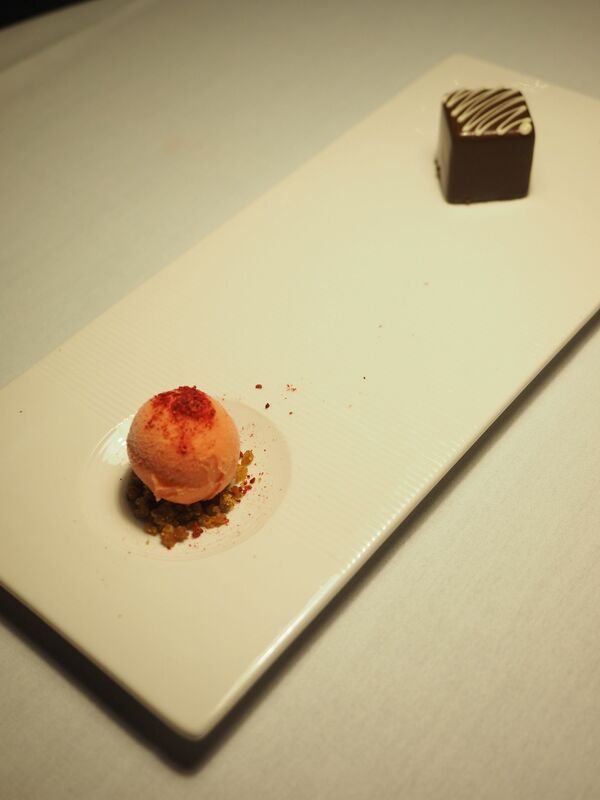 This summer, the head chef Justine has developed an interesting and affordable 7 course degustation menu to make the dining experience at the restaurant even much unforgeable. 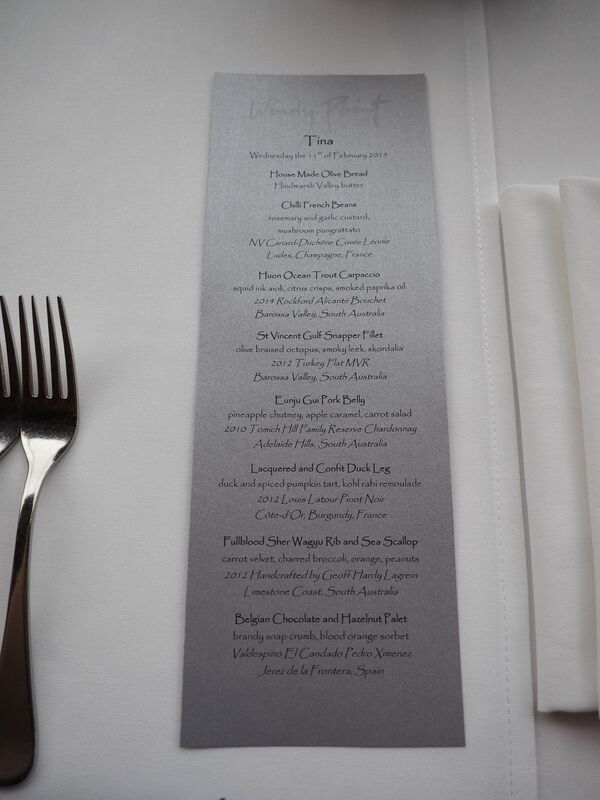 The degustation cost $115 for 7 courses some non-stopping food and $185 with wine flight. It is a very affordable price considering the amount of food and the quality of all dishes. 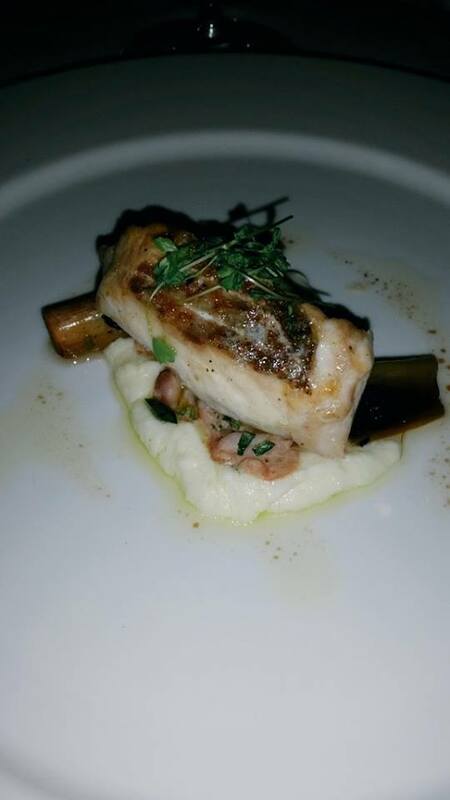 The degustation consisted of a French bean dish, a Ocean Trout entree and a Snapper main as well as meat dishes, including pork, duck and Wagyu beef. The dessert was a Belgian Chocolate and Hazelnut Palet. This menu caters for different needs and the restaurant is also professional enough to have a separate Vegetarian menu which also includes exciting dishes such as steak tartar. The meat menu started with the restaurant’s House Made Olive Breads which were crispy on the outside and warm and soft inside. 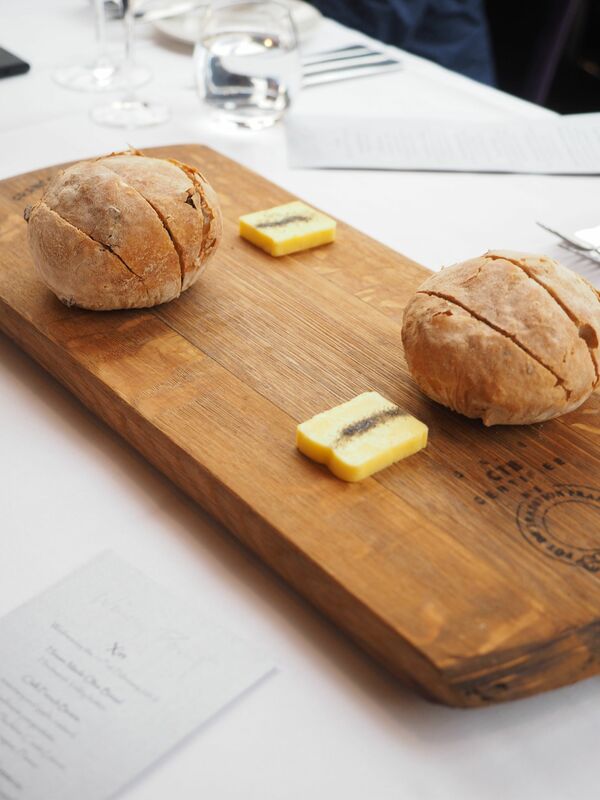 With every bite, the crunchiness of the bread just mixed very well with the Hindmarsh Valley Butter. At the same time the breads were out, we were served with the Chilli French Beans entree below. 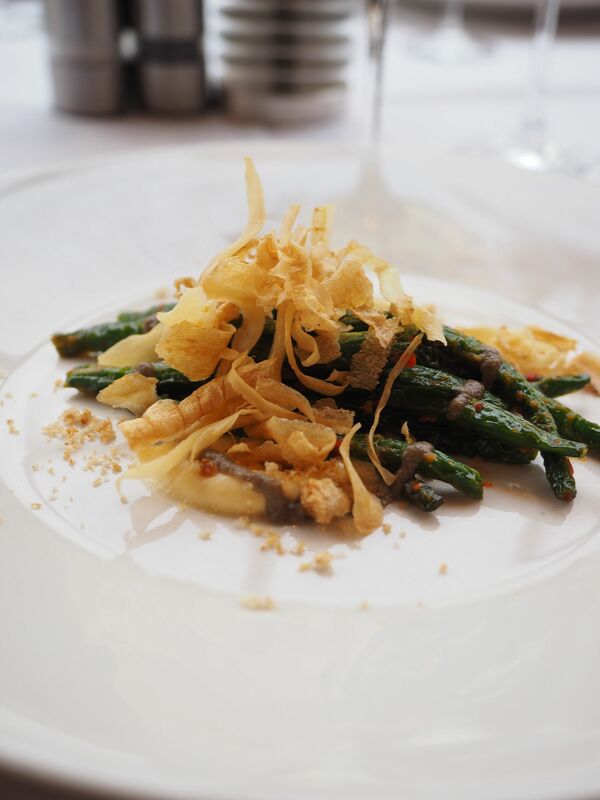 This dish was spicy with near-crispy beans as well as crunchy condiment. This is such a good option to go with the breads because the slight spiciness can combine well with the bread and leave the mouth with a pleasant flavour on the palate. The crispy condiments also enhanced the mouthfeel of this dish. After finishing the dish, my bread went over the whole plate and wiped up everything. It is too guilty to leave anything behind – I simply liked it. 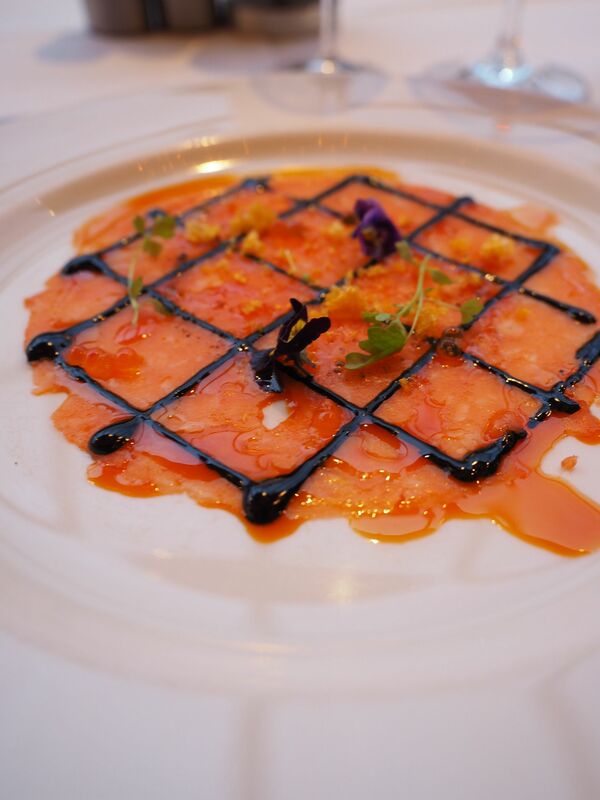 Huon Ocean Trout Carpaccio, squid ink aioli, citrus crisps, smoked paprika oil. For seafood lovers, the next course will be your amazing indulgence! A St Vincent Gulf Snapper Fillet main followed the process and appeared on our table. With such a delicate fish, the flavour was fully developed with a hint of saltiness as well as decent fragrance. The smoked leek was the highlight of the dish and it added irreplaceable flavours to the dish. The braised octopus tasted pretty much like meat/bacon in texture and enhanced the mouthfeel of the dish. Well done! For meat fanatics, the following dishes will impress you. With three courses of meat dishes, meat lovers are definitely experiencing everything the restaurant has of offer. Eunju Gui Pork Belly followed the snapper main. Eunju Gui is a staff member at the restaurant and it is really glad to see the employer recognise their staff contribution. 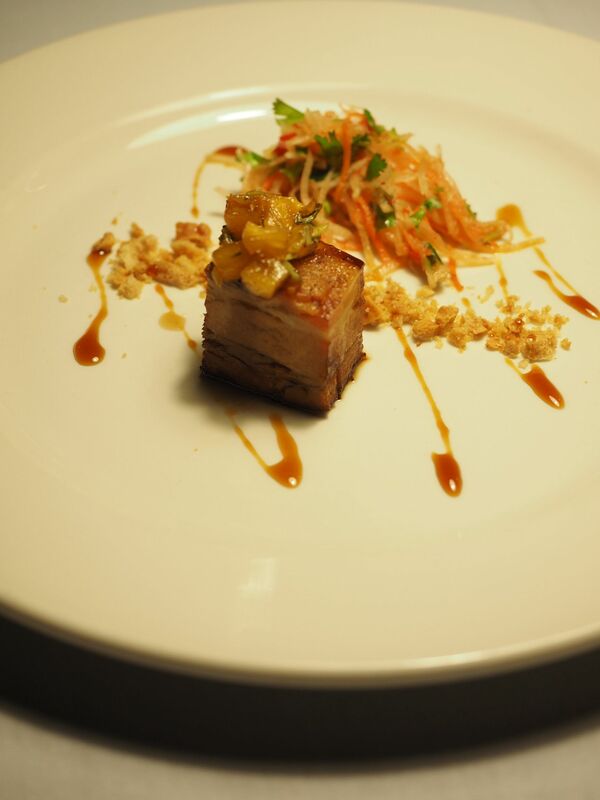 This dish is highly influenced by Asian cuisines and flavours while the pineapple chutney added sweetness and fruitiness to the dish to promote the pork flavour. The pork was cooked so soft that the fat melt easily in the mouth. If you like poultry, the following dish will be your delicacy. This is probably one of the best confit duck legs I ever had! The leg was cooked to perfection and the meat are easily taken off the bone with fork and knife. 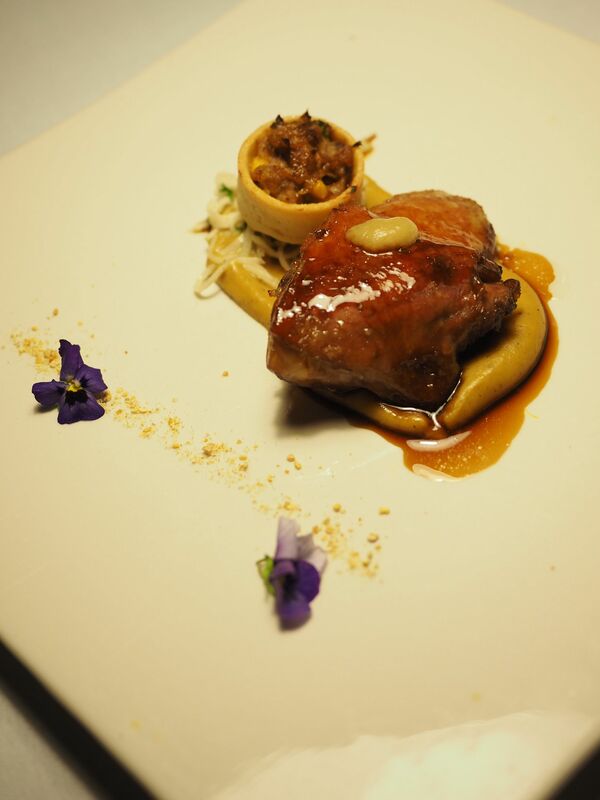 With a slight hint of sweetness, the duck’s flavour was enhanced on the palate. The meat was very tender too and it does not need much effort to bite or chew :). Did you notice the bone-marrow like tart? Many of us thought it was a bone with grilled bone marrows. It was actually a tart filled with duck and pumpkin. It was delicious too and a good creation to be added onto a dish. Well done! At this point, Tina and I were very full but I am still looking forward to the next dish, Fullblood Sher Wagyu Rib and Sea Scallop. I’ve had sher wagyu beef for many times and the brand is one of the three largest Wagyu Beef producer in Australia. I really wanted to see how Windy Point did the beef. It was magnificently delicious! The beef rib was taken off the bone, chargrilled and then braised in their special soup for 24 hrs before serving. The dish itself was impressive in both looking and flavour. The beef rib was cooked to perfection with plenty of flavours. One can still taste the chargrilled flavour while the inside was very moist and juicy. It was easy to cut and to flush down the throat with a good Lagrein. 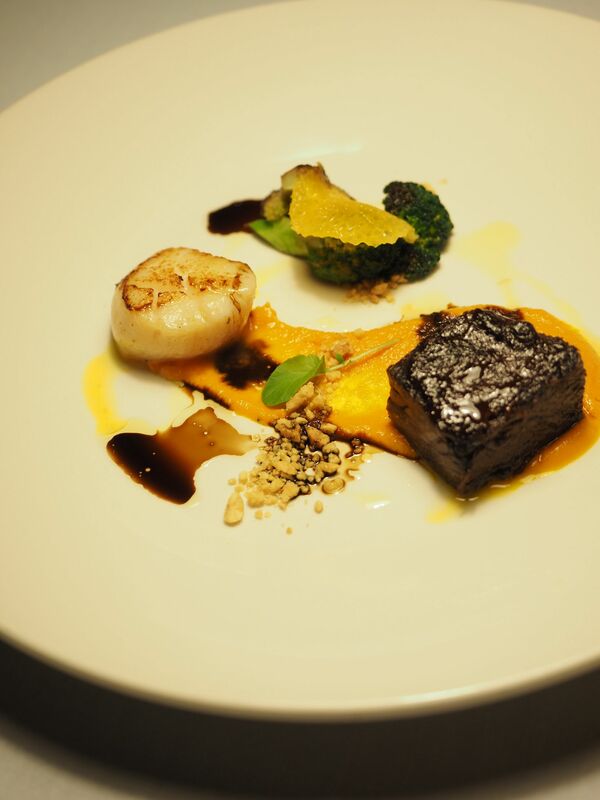 The scallop was very tender and flavoursome to complement the flavours of the wagyu beef rib. The fruitiness from the orange and the nutty flavour from the peanuts helped to promote the overal flavour and mouthfeel of the dish. This was my favourite dish that night. Well done! 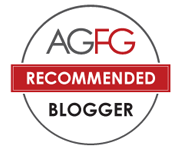 G’day Great write up in capturing the experience on the night Xin and it was an AWESOME night with OUTSTANDING food and wines for all and glad I got to catch up with Tina and you too thanks to Dougal’s invite! Absolutely Joanne! I am looking forward to reading yours. It has been a long while since we see each other. Hopefully with me coming back to blogging and you are back soon we can catch up at various events. I haven’t been there for many years but now it looks like I should be back regularly. Your pics look much better than before. Did you upgrade your camera?